Photo: A lone man watches the ocean amidst the trash left behind by attendees of the annual Ganesh Chaturthi Festival in Mumbai, India 2009. As a photographer, I spend most of my time alone. I meet random strangers in airports and airplanes, city markets and hotel lobbies. There really isn't anything glamorous in what I do--it just sounds interesting to the naked ear. For years, I've tried to compartmentalize my life, separate my work from reality, from career to personal life--find an equilibrium between fact and fiction and filter everything through the membranes of my nocturnal psyche. But lately, I've realized that it's literally impossible--impossible to decipher the difference between what I do behind a lens and what I should be doing when I put it down. Ultimately, there is no difference. Lately, I've been living out of airport terminals and empty-cold hotel rooms, eating dinners alone and surviving on hope. Talking to my mother on the phone, I'd lose track of where I am, what time it is and what day I'll be home. Sometimes,I'd lie to her by saying I'll be home soon--knowing very well that I have more destinations in between. It tugs on my heart strings--and late at night, I'd sit awake, wondering what else I've missed in life. Birthdays go unnoticed, including my own. Thanksgiving day was spent eating a bag of beef jerky on a plane. Invites to events I'd get invited to sit rampant in my mail box. And as I read all the status updates of my Facebook friends, I can't help but to envy those who have normal lives--those who have a place to call home. I miss going to the movies. Sharing a drink or two. Sleeping in on rainy days. Grocery shopping with my mom. Praying with my family. Sure, there will be many who will read this and say I'm complaining, ungrateful for the job I have or just whining about my life. And to be honest, they have every right to think just that--but let it be known, that this blog was not to glorify what I do or bring to light my career, but rather, to bring you with me behind my lens--to show you what it's really like to have it consume your life. Blogger Note: I'm currently on assignment in Vancouver, Canada to cover the arrival of the Olympic Flame. I'm currently in Paris, France en-route to my next assignment in Vancouver, Canada. I've spent the last eight days in Lebanon--in and out of various cities and villages. I went to Lebanon on various assignments--one of which was to train young photographers on how to work in hostile environments. But in a world of contradictions, Lebanon is both beautiful and fragile, yet full of adventure at every turn of the corner. Men dressed in full military fatigue and in the rural parts of the country, M-16 machine guns guard every intersection--but as you'll see below, it's life as normal in one of the most beautiful cities in the Middle East. Instead of showing you the stereotypical image you're used to seeing from a country that has suffered through twenty years of cival war, I'd like to show you the opposite. People here are happy, they live normal lives, and everyday is a new day for them. Life has been hectic as of late. I haven't had much time to sleep, eat, nor organize my life. I'll be in Vancouver for five days to film the arrival of the Olympic Flame on Canadian soil as they prepare for the 2010 Winter Olympics. Hopefully, I'll be able to post again soon. In the meantime, I hope all is well. Please take care of yourselves...and each other. Tomorrorw morning I depart for Beirut, Lebanon. I'll update you soon. Photo: A single home sitting on stilts, off the coast of Nias Island, Indonesia 2009. This post is dedicated to my dear friends in Brazil: Fernao Silveira and his lovely wife Bianca, their beautiful parents Antonio Jose Rossi and Teresa Dos Santos Rossi. For they have taught me so much during my last assignment. Sometimes, when I put my camera down and take just a few steps back, the world before me swallows me whole--finds the rhythm to my heart--and some how, I am able to march to the beat of my own solemn pace. Lately, I've been traversing from city to city, country to country--living a life lost in sublime poetry. A million people pass me by, thousands more rub shoulder to shoulder--yet in a world of billions, I've come to realize that we are all mere mortals marching to the beat of one. One planet. One people. I've seen the world from one end to the other, ventured into the depths of danger and back and even walked the path less traveled--yet, if you were to ask me which destination is my favorite--I'd be at a loss for words, freeze in the moment--and like an actor without lines, I'd find myself improvising, looking for a way out, trying desperately to slither my way off stage. I've seen so much through my lens, but to see the world without scripts and screenplays,lights and cameras--I must admit that I've seen so little. It's different when you view the world through elements of film and glass. You only see what you frame. I cannot begin to tell you where my favorite locations have been, which country is better to vacation in or where the best foods may prevail, but having framed much of the world, what I can tell you is that the world is much smaller than you think--much the same--as you'd never thought it would be. You'll never hear this from a travel agent, but believe me, the sun rises the same way in Indonesia as it does in Brazil. The Pacific Ocean ebbs and flows, travels between land and sea the same way as the Atlantic. Beauty is all around us. And if you look to where everything begins, you'll see that we all breath the same air, drink the same substance and walk upon the same land that stretches far beyond our reaches. You too will realize that the only thing that divides us--that makes us different and unique from one another are mere lines of latitude and longitude--invisible to the naked eye. Our languages and cultures crisscross and weave into the very fabric that defines our existence. At the end of the day, we are all humans. We all reside on one planet. Flying out of Brazil, I sat beside two men: one from Israel, the other from Lebanon. Two foes sitting side by side, leaving a country no where close to their home--yet, by virtue of 35,000 ft, they were the best of friends--sharing stories, laughter and fellowship. I don't know what I've done to deserve to see the world like I do, or what obstacles and challenges may come my way, but the one thing that I will always cherish is the notion that we are all interconnected--marching triumphantly to the tune of one symphony, one beat--in a world of one. Blogger Note: I apologize for my lack of posts as of late. My travel schedule has been hectic--flying out of Brazil, straight to Toronto and then to New York. I'm back at base for the next few days, then I will be leaving for an assignment in the Middle East next week. I hope all is well with you, my dear readers. Thank you for reading. 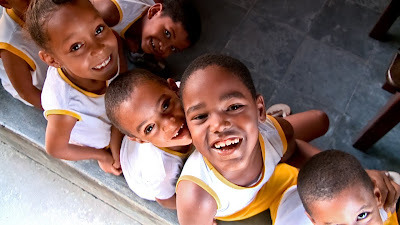 Photo: School boys in Bahia, Brazil, 2009. Photo: Off the coast of Banda Aceh, Indonesia--March 2009. I awoke this morning to the sun peeking through my hotel window. Looking out, I saw the haze setting in, streaks of light glistened and danced through openings in the cloud. The morning traffic had already started without me. Engines roared through the streets of Sao Paulo while I laid still, motionless--looking out at a world that never stops. I felt empty this morning. Lost. Devoid of hope, jaded by fate. I felt like the world had flipped inside-out, twisted and turned like a kaleidoscope--melting away the very elements that binds us together. I felt sadness and sorrow, pain and displeasure. I had heard the news--felt a knife rip through my heart. Oceans away, families are torn, people live and people die. It scares me to get up. Afraid of what I'll hear, see and feel. For the first time in my life, I'm afraid to face the world--to accept the truth--because when you live life through a lens, it quickly becomes your mask--a shield to protect you from reality. My alarm clock went off--but at that very moment, I didn't care--because I knew that a thousand miles away, a different kind of alarm was going off, telling the inhabitants of an entire island to seek higher ground. Indonesia and Samoa hold a special place in my heart. I saw flashbacks of images I had captured, the people I've met and the memories I cherish. It's different when you're a photographer--you see things differently, you learn to cherish moments captured in time like there's no tomorrow. And no matter what type of mask is flung before you, reality some how seeps through the pores of your soul--through the toughest of any skin. And just like that, you're human again, you feel for the people suffering, you pray for their well-being. I used to capture the world in all its beauty, pain and reward, triumph and tragedy--all without a care for whom was staring at my lens. The shot was all that mattered. The people and their suffering was the cost of doing "business." I was young, ambitious, and naive. Maybe that's why I've changed--somehow, I've turned full circle--and like a vulture turned prey, I've taught myself to love the people I see through my lens. Sitting on my bed, I began to pray. I hope my friends are safe. I am scared. I am worried and I am desperate to hear from them. I've tried calling, but my calls are answered by a machine--speaking a language I cannot understand. I've been in Brazil for almost two weeks now. My body aches, my mind is numb and my soul searches for balance. My schedule takes me from one city to another, one village to the next--but no matter how busy I am or no matter how hectic my life may be, Samoa and Indonesia will always be in my heart, in my dreams, and most importantly, in my prayers.